Next time you’re throwing a party, look no further. I have a Mega Chocolate Chip Cookie Cake that will feed a crowd! 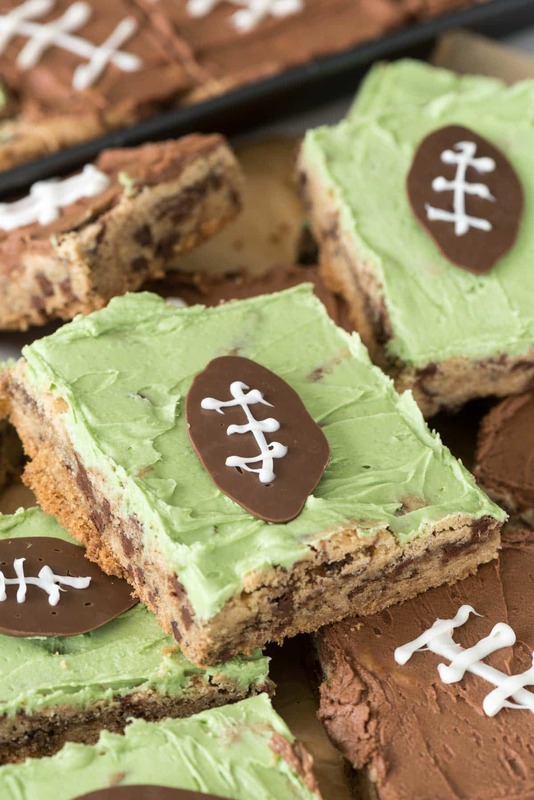 It’s the perfect easy recipe to feed those hungry football fans at your next party! Are you ready for some football? The season starts tonight! Aren’t you excited??? My husband is over the moon. He’s giddy with anticipation. I’ve cancelled all Sunday plans for the next 5 months, unless of course those plans are going to a football party. In which case I’m happy it’s football season because then all the food. After I finished laughing, I told him one of the other drafters better send me a photo AND video of that. JUST FOR BLACKMAIL PURPOSES. As is the tradition for his annual nerd boys weekend, I make treats for him to take along. 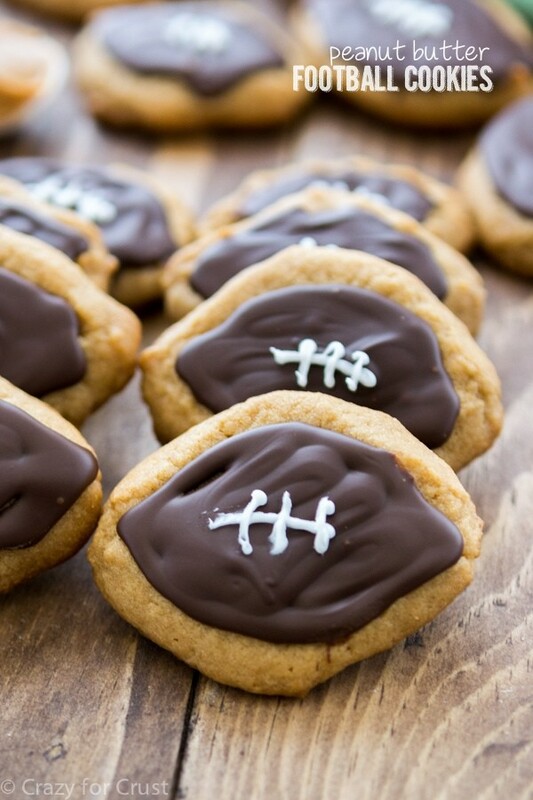 I’ve sent football cookies, football brownies, football pies and football dip. This year I went ALL OUT. I made him a MEGA Chocolate Chip Cookie Cake to take with him with a HUGE pan. I even decorated it in two ways because it’s so, well, MEGA. The cookie pan is one of Wilton’s newest pans, the Perfect Results Mega Cookie Pan. Officially I think they invented the 15×21″ pan so that you can bake mega amounts of cookies on it in one batch. You can get up to two dozen cookies on there for baking, which makes it easier to bake all at once with less cookie sheets and transfers and all that. 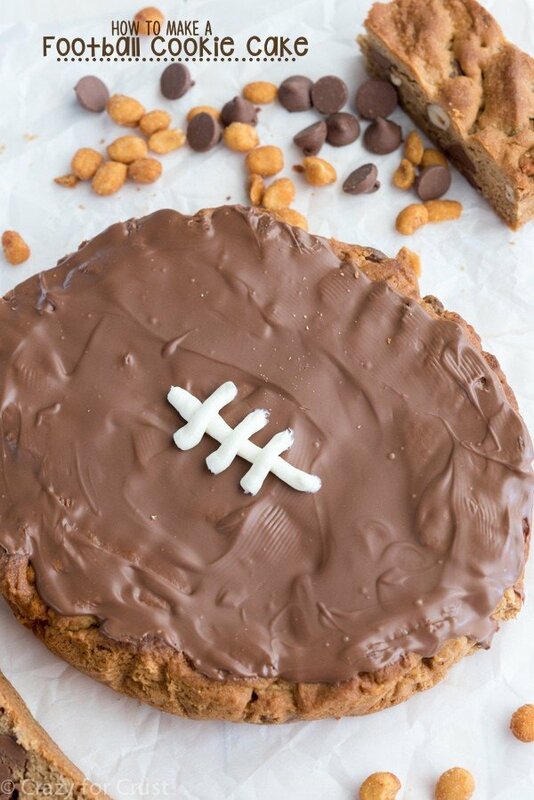 Of course, I saw it, and all I thought was “FOOTBALL FIELD SIZED COOKIE” because that’s the way my mind works. If you’re having trouble picturing what a pan that is 15 inches by 21 inches looks like, picture two 9×13″ pans next to each other and then add some. Yeah, the thing is huge. It could double as a cat bed if I had a cat. But I’d rather use it for baking cookies on…and for making a mega chocolate chip cookie cake! I decided to use my favorite chocolate chip cookie recipe for the cookie cake. That recipe starts with brown butter, which is the ONLY kind of butter you should use forever and always, okay? It adds so much flavor to the cookie batter. It’s such an easy recipe, even if you’ve never browned butter before. I doubled the recipe and it made a huge amount of cookie dough, perfect for a crowd. I can’t wait to use this pan for birthday parties and baking Christmas cookies! I could have just done one decoration for the whole cookie cake, but that’s boring. Plus, I like options and I bet you do too. I decorated half the cookie cake with chocolate frosting and piped laces with Wilton Candy Melts. 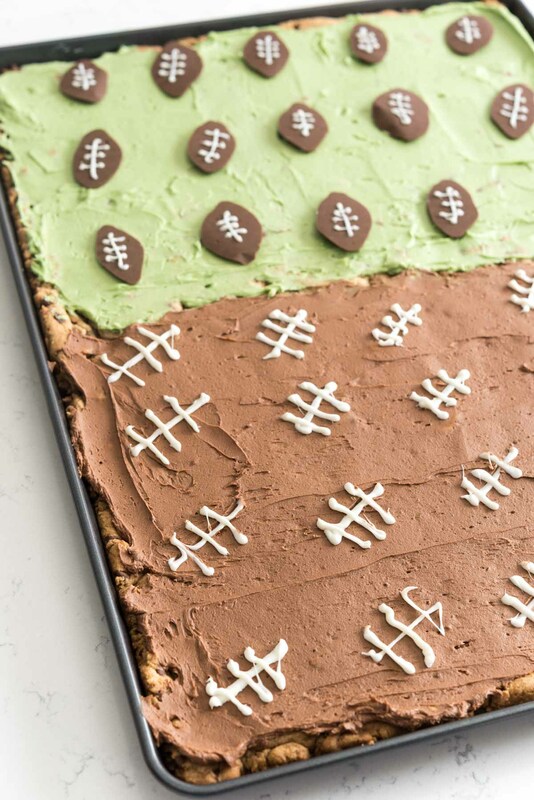 I decorated the other half with my favorite vanilla frosting that I tinted green, and then I made chocolate footballs out of more candy melts. You could also make one big football out of chocolate or frosting, if you prefer. Of course, if you don’t like options, just pick one…and if you do good luck with that. Chocolate or vanilla? I can never choose. 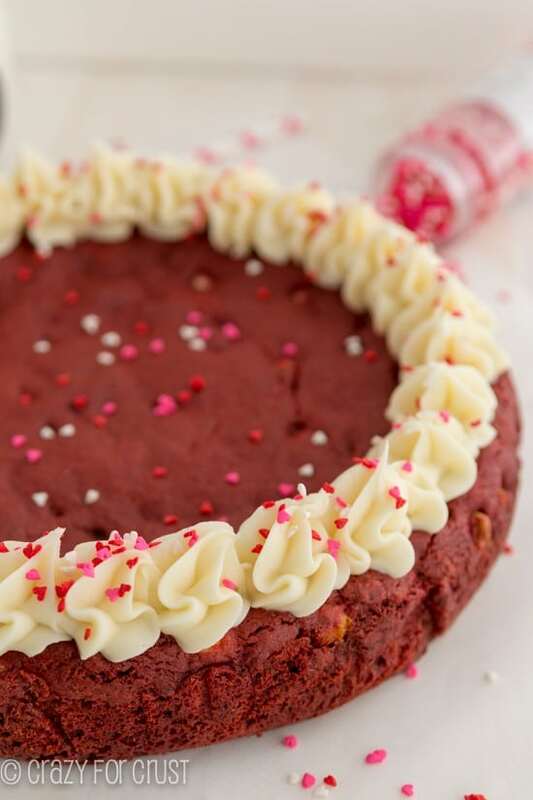 Make a Mega Chocolate Chip Cookie Cake fit for a crowd! This easy cookie recipe is perfect for a party. Dress it up for football season or any reason! Preheat oven to 350°F. Line the bottom of the Wilton Mega Cookie Pan (15x21) with parchment paper and spray the bottom and sides with nonstick cooking spray. Place butter in a small saucepan over medium heat. Stir occasionally until the butter is melted, then cook on medium-low, stirring occasionally, until the butter turns a rich amber color. This will take about 8-15 minutes depending on the heat on the stove. Once it starts to change a bit be sure to watch it, it can burn fast. Remove from heat and let cool for 5 minutes. Place granulated sugar and brown sugar in the bowl of a stand mixer fitted with the paddle attachment. (You can also use a hand mixer.) Turn on the mixer and slowly add the butter, letting the mixer run until the mixture is smooth. Add eggs, one at a time, mixing between each, then add vanilla, baking soda, and salt. Slowly mix in flour until combined, then stir in mini chocolate chips. Press the mixture evenly into the bottom of the prepared pan. It’ll just fit. Bake for about 12-15 minutes or until it just looses its glossy sheen (these taste better under cooked). Let cool. To make the chocolate footballs: melt the chocolate candy melts according to package directions. Line a cookie sheet with wax paper. Place chocolate in a pastry bag and cut off a small tip. Pipe footballs onto cookie sheet. Chill. Once they are hardened, melt the white chocolate candy melts according to package directions and place them in another pastry bag. Pipe laces onto the footballs and chill to set. Tint white frosting green using Wilton food coloring. 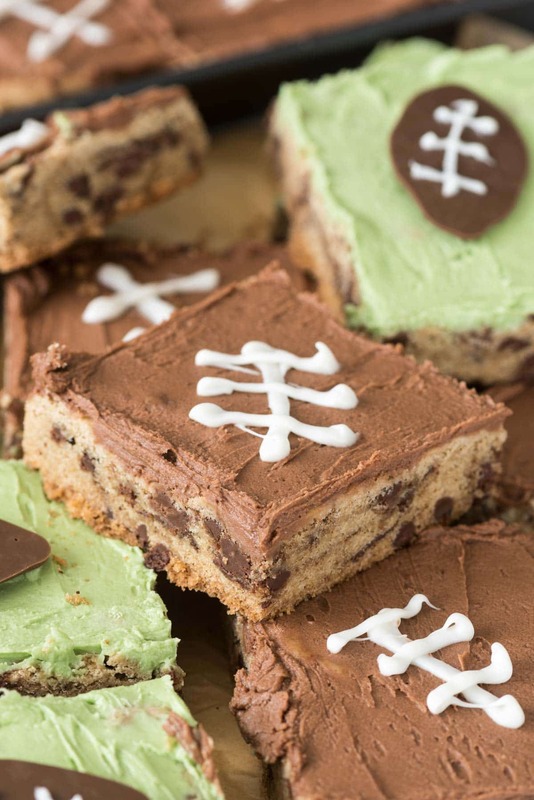 Frost half the cookie cake with the green frosting. Top slices with a chocolate football. Frost the remaining half of the cookie cake with chocolate frosting. Slice the cookie cake and then pipe laces on each slice. Note: you can make the entire cake with one decorations, just double the amount of frosting for whichever decoration you desire. Get tons more Game Time ideas online and on Facebook, Twitter, Pinterest, or Instagram. This post has been sponsored by Wilton. All opinions are 100% my own. oh wow this is so sweet. making cookies is always my favorite. 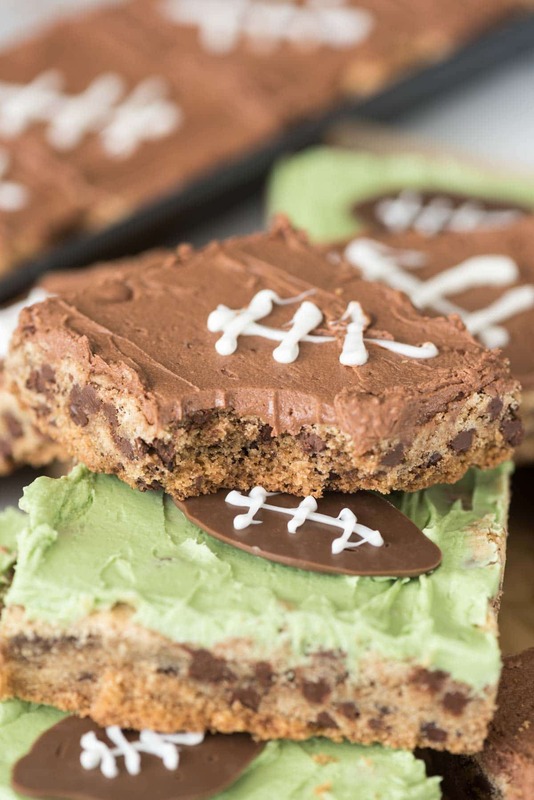 my husband isn’t a football lover but i need your recipe for my kid’s birthday party. I love the way you decorated them, very nice. this recipe should be used for Olympic season, or anything else. it’s always great. Wow, this looks gorgeous. I love the decorations. The cake seems so delicious. Thanks for sharing, Dorothy. Those are adorable and sound delicious! I hope Mel knows how lucky he is ! ?